As seen in US Weekly magazine (August 10 2009 issue, p69). Enriched with the Desert Rose Flower Complex, and as many active ingredients as Super Aqua serum, this mask delivers all the effectiveness of an intense moisturizing anti-aging bath for the skin. 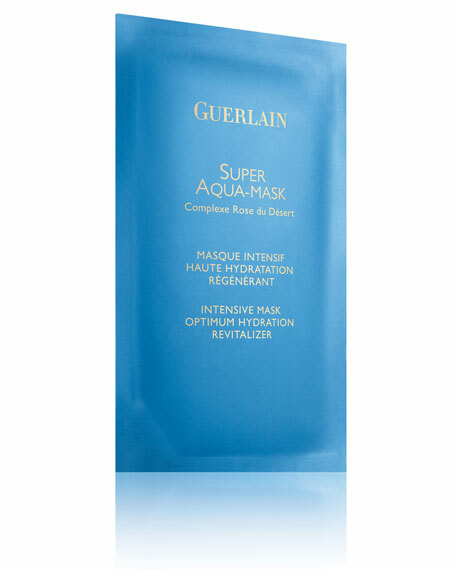 Super Aqua-Mask comes in the form of 6 silky sheets to apply on a perfectly cleansed face. After 10 minutes, the hydric mattress expands and moisture-boosted skin is plumped and revitalized. Freed of signs of fatigue, the skin appears visibly smoother, supple and luminous. This rejuvenating face bath should be used once or twice a week, and is also ideal after a long flight.